"My life's work has been in lawful access to common land and the legislation surrounding lawful rights of common "
I have read your letter dated 19/8/2016, the contents are not acceptable where section 9 commone chief registrar on matters relating to land registry documents land legislation is concerned, neither can it be accepted under the conveyance legislation, there is also the 2006 fraud act to consider where the application to have registered the section 9 common land which is by way of false representation by the applicant Simon Masters of Dixon/Rigby/Keogh, the failure of the land registry clerk to demand full disclosure of title deeds to pre-date 1189 and not an Epitome of titles that cannot be disclosed for examination, my suggestion to Mr Masters was to have the civil courts to make an order for full disclose and to make judgement, Mr Masters refused to take the matters to court, denying his clients instructions. 2) The applicant and his clients have refused to help in this matter by failing to disclose documents it is claimed exist to include copies of the application made to Birkenhead land registry, this is in breach of the 2006 fraud act failure to disclose. 3) Sandbach common land is not freehold and as such the land was vested under section 9 of the 1965 commons registration act in the protection of the registering authorities, in your letter you state that you have files to show previous (4) registrations, please then may I have copies of those documents? I have read the advice on registering land with the/a land registry office and it is required that full disclosure is demanded, to make false applications is punishable by prison or a fine or both, that procedure has not been complied with to gain CH629392. 4) My lifes work has been in lawful access to common land and the legislation surrounding lawful rights of common, this to has brought me into various other legislation to include criminal law and conveyance, rights as described in the Magna Carta and the ECHR. 5) May I bring to attention sections from the 1965 commons registration acts? section 1(1) of the act requires registration in accordance with the provisions of this act to the exceptions mentioned therein, Land in England or Wales which is common land or a town or a village green; rights of common on or over such land, and persons claiming to be or found to be owners of such land by virtue of this act and no rights of common over land which is capable of being registered under the lands registration acts 1926 and 1936. 6) section 3(1) for the purpose of registering such land as is mentioned in section 1(1) of this act and rights of common over and ownership such land every registration authority shall maintain a register of common land and a register of town or village green and regulations under this act may require or authorise a registration authority to note on those registers such other information as may be prescribed, any register maintained under this act shall be open to inspection by the public at all reasonable times....this section has been breached by the authority, Failure to disclose 2006 fraud act. 7) section 4(1) subject to the provisions of this section, a registration authority shall register any land as common land or a town or a village green or as the case may be, any rights of common or ownership of such land on application duly made to it and accompanied by such declaration and such other document(if any) as may be prescribed for the purpose of verification or of proving compliance with any prescribed conditions, no person shall be registered under this section as the owner of any land which is registered under the land registration acts 1925 and 1936 and no person shall be registered under this section as owner of any other land unless the land itself is registered under this section. 8) May I come to page 2 of your letter "Common Land" where you say "Asserts" the land is common land, the only plan/map states it is common land, such information can be gained from the authority and archives that the land is common land, and to further answer that paragraph you will see above 3(1) the council refuse to disclose, your second paragraph on claiming ownership of any section 9 common land that is correct but, a statement of truth by way of application is required otherwise fraud through false representation is committed,this has been my field of expertise for over 40 years, but whilst on the subject of claiming ownership of common land, there is case history where my friend and colleague in these matters of proving owners was in the Irby Fell case where Paul Stafford QC, chancery bar took on that case to show that the chief registrar was wrong in accepting a claim to ownership as Lord of the Manor by the applicant, here the villagers fought and won citing the statute Quo Warranto 1189, as in this matter no evidence to show ownership of Sandbach Common can be disclosed, Birkenhead were wrong in creating CH629392, there is statement on the land registry document,"This copy is not an "Official Copy" of the register, an official copy of the register is admissible in evidence in a court to the same extent as the original, a person is entitled to be indemnified by the register if he or she suffers loss by reason of a mistake in an official copy., perhaps you would explain, all applications to the land registry have been made by false representation, the last by Simon Masters, he too has committed a "mistake", he too must indemnify his clients, case history; In G&K ladenbau Ltd-v- Crawley and de Reya (1978) 1WLR 266, it was held that a solicitor who negligently failed to search the register of common land was liable in damages to a client who suffered financial loss as a result, what then for council solicitors and the legal team at the Land registry for failure? 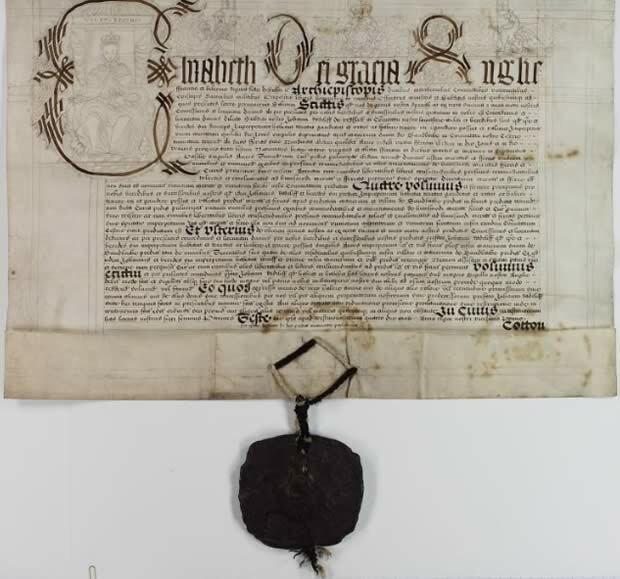 9) Your claim that the 1579 Royal Charter, petitioned April 1579 by Sir John Radclyffe of Ordsall, granted in May 1579,as Royal Assent, is just franchise and may be capable of registration at land registry, well Sir John was lord of the manor of Sandbach, however the common land was not part of his demesne lands and the petition,and not application, was made on behalf of commoners farmers and growers, the common land is not freehold otherwise Sir John would not need approval as the land would have been free and subject to fee simple and would have been sold at the same time as his Manor house "The Old Hall "
10) May I draw your attention to the "exaggerated"plan of the area in question, the claims on the register only show buildings that have been conveyed, and as they are on none freehold land they have no jurisdiction, whereas another page of the document claims ownership of land lying south of the Congleton rd sandbach, where in particular is this parcel of land? there are no plans as has been stated by the Cheshire archives to pre-date 1841, there was no plan sent by Sir John Radclyffe with his petition, there would/should have been a plan/map included with the application by Masters and with all the other application for registration for identification purposes, even if there was a legal application for reference purpose made by any individual, as you say, any one can apply to be registered as owner, just as the authority were registered under section 9 1965 CRA without any jurisdiction because they had no ownership in the soil, I too have claimed section 9 common land, but can only be registered with the authority and not land registry as the common land is not freehold. 11) For the 1965 CRA, Aberystwyth University were commissioned by the Commons commissioner to survey lands throughout England and Wales for registration under the act, once the survey had been completed the commons commissioner made his judgement, town and village greens were made the property of the local authorities whereas manorial waste(common land), not waste land of a lordships estate demesne land but waste of a manor(village), this waste/common land was registered as common land to prevent no mans land from becoming any mans land and vested the lands into the protection of the registering authority for protection under section 9 of that act, the act gave no jurisdiction to the authority, section 9 1965 act; where the registration under section 4 of this act of any land as common land has become final but no person is registered under this act or the lands registration acts 1925 and 1936 as the owner of the land, then, until the land is vested under any provision hereafter made by Parliament, any local authority in whose area the land is situated may take steps for the protection of the land against unlawful interference as could be taken by an owner in in possession of the land, and may (without prejudiced to any power exercisable apart from this section) institute proceedings for any offence committed in respect of the land, section 10 of the act makes conclusive of the rights so registered, this means hat the local authority can criminal action proceedings under the criminal damage act 1971 (1) and also civil action to prevent trespass, but it is doubtful if the authority could sue for damages since the section gives it no legal interest in the soil, this section is in respect of section 16 of the registration act "Commons where no person is registered as owner"/where the commons commissioner is unable to discover the owner of a registered common, there is no procedure(as there is in the case of a town or village green) for vesting the common in a local authority or other person. 12) This is not the first altercation I have had with Sandbach authorities, in 2010 there was an issue where the authority had plans to create a pay and display car park on the last remaining part of Sandbach Common, I entered into the same argument then as I am doing so now, my challenge for full disclosure of pre-registration of title deeds was made, the archivists stated that there was no documentation to show Sandbach common title deeds or that it was demesne lands of Sir John Radcliffe's estate or of any other estate, i was told that I had opened a can of worms and that the authority would need to look elsewhere for land to develop, this is the same Cheshire East that alleges a conveyance to Sandbach town council, yet could not prove ownership by disclosure then in 2010, now Cheshire east say "if the town council say there was a conveyance "so be it" and will not engage with me to gain disclosure..
13) Paul Stafford QC chancery bar as I have stated previously examined the statute Quo Warranto (by what warrant) of 1189,(in the Irby fell case) although it was post 1189, the word Quo Warranto is a prerogative writ requiring the person to whom it is directed to show what authority they have for exercising some right or power or franchise they claim to hold, the statute had its origins in an attempt by King Edward 1 of England to investigate and recover Royal lands, rights and franchises in England, in particular those lost during the reign of his father King Henry 111, from 1278 to 1294, Edward dispatched justices throughout the Kingdom of England "by what warrant" English Lords held their lands and exercised their jurisdictions(like to hold courts and collect profits), at first the justices demanded written proof in form of charters, but resistance and the unrecorded nature of many grants forced Edward to accept those rights peacefully exercised since 1189, later quo Warranto functioned as a court order or writ to show proof of authority; for example demanding that someone acting as the sheriff prove that the King had actually appointed him to that office, that is then the explanation of the statute quo warranto 1189, the date 1189 was also the assesion to the throne of Richard 1 of England and it is believed thats why 1189 was used as a cut off date, there are Quo Warranto pleas from the reigns of Edward's 1, 11, 111, that were published by record commission in 1818, this is apart from the Irby Fell one and the various ones I have made through my career, all of which have challenged land registry documents. 14) There is a mention of the building, the Market Hall, AKA town hall being occupied and owned by the urban council and being registered under the board of the inland revenue 1914, but this entry has been deleted by Sandbach council because no evidence to show title was disclosed so the inclusion on the inland revenue 1914 register has been scratched out, no reason or explanation from the council either Cheshire east or sandbach town is forthcoming, the search engine shows that the said registration of 1914 is "missing" and the entry Inland Revenue 1914 is scratched out, the archives have no information on why. 15) The noble man De Crewe, did purchase the old hall from Sir John Radcliffe, this was built by his son and later extended by the De Crewe Family, that is noted in the archives, but does not include any other documents,of course there is a lot of hearsay, but nothing conclusive to show other ownership of buildings in the area, the one original document/manuscript is attached to this email. 16) I would hope to conclude my reply to your letter by highlighting my reasons why the land registry document CH 629392 to be destroyed, the land is not freehold, Sir John Radclyffe of Ordsall 1269 was the Sheriff of Cheshire, history shows he was in the service of the Monarchy, Sandbach Old Hall was built by Sir John Radclyffe's son John Radclyffe Lord of the Manor of Sandbach, it was he that petitioned queen Elizabeth 1 for the charter (attached), the Hall was built on the ruins of a previous hall which was burnt down, Sandbach Common was not demesne lands of the Radclyffes estate, had it have been, then there would not have been any need to petition for a market day. 17) I have forwarded onto you 3 statements from the Cheshire Archives to show there is no evidence that the land is freehold, conveyed or purchased, no records to substantiate the claims or persons making those claims, no documentation has been disclosed by the applicants or by the engaged legal team by the applicants to argue his clients claim, the solicitor engaged has refused to disclose the method or format that was used to apply for registration. 18) The Birkenhead land registry did not comply with the regulations for full disclosure when applying to have a land registry document created, may be in error or by no past experience on such matters as registration, I have quoted Quo Warranto 1189, because that is the statute to comply with when making applications for ownership registration, subject to that,the land/properties cannot be considered for the lands registration acts 1925 and 1936, however, the area is subject to section 193 1925 law of property act for access from all points of view, it was also registered under section 194, now section 38 which prohibits any developments and other activities that impede access, application in the first instance should have been to the secretary of state,this had not/did not happen, so the application for for registration of none freehold land was/is not the remit of the land registry. 19) My application to have land registry document destroyed is correct, if not, then the applicants can argue with documentation against the land registry document CH 629392 being destroyed, so far it cannot, neither can the land registry officer at Birkenhead claim to have seen title deeds to include the obligatory plan to predate Quo Warranto 1189,(archives have stated that no plans of the area pre-date 1841) all parties involved with the registration document have never seen such titles because none exist, you say that the post's of town councilors and town council is not a matter for you, however, the same challenges have been made as the challenge under Quo Warranto 1189, my challenge has not been met with because no evidence either with the local authority or the archives exist, this then shows that the alleged conveyance to the unelected town council was abuse of office by the previous claimants, Congleton borough council, Sandbach borough council, Sandbach county council, Cheshire east council, each and every alleged conveyance of whatever method, was fraudulently conducted, that is where I believe the land registry should be involved because false representation to have a land registry document created should have been examined.